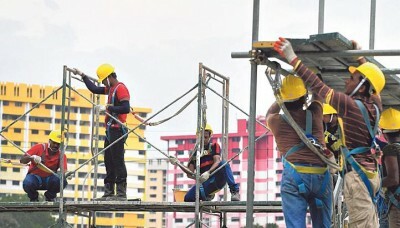 SINGAPORE will find it difficult to recruit foreign construction workers even from newer markets like Sri Lanka and the Philippines if it does not match salaries that employers elsewhere are offering. This is the view of agents, employers and migrant rights activists who were reacting to the news that Singapore employers are stepping up recruitment of workers from these two countries to cope with the construction boom here. The Building and Construction Authority (BCA) said it is helping to set up test centres in these two places to screen and train potential hires. Experts, however, pointed out that Singapore faces strong competition from the Middle East and Cyprus, which have been employing Sri Lankan and Filipino construction workers for several years now, and pay them more than $1,000 a month. In contrast, construction workers here, such as those from India and Bangladesh, are paid as low as $700 a month. Association of Employment Agencies (Singapore) president K. Jayaprema said the salaries of construction workers here have stagnated in the past decade. This is because employers feel that "the workers are still earning more here than what they earn at home" and do not want to raise salaries. She pointed out that construction workers also spend $1,000 to $2,000 on courses, and to take the test to come to Singapore to work. They save on this money when they go to places like the Middle East, which do not have such requirements. Ms Jayaprema, who owns an agency recruiting Indian and Bangladeshi workers, said: "Workers see this as a cost in coming here and they want to recoup the cost with good salaries." Ms Bridget Tan, chief executive of Humanitarian Organisation for Migration Economics (Home), said Singapore must contend with the fact that fewer Sri Lankans and Filipinos will come over the years, as the economic situation in their home improves and job opportunities grow. This has been the case for Chinese and Indian nationals who used to come to Singapore in droves in the 1990s. But they are staying away because of better job prospects back home. Agents said Indian construction workers can earn about $600 working at home, which is not far from the $700 they fetch in Singapore. Chinese construction workers can earn close to $1,000 at home which is near the average of $1,200 they draw here. While Sri Lanka and the Philippines can help to meet some demand, experts expect India, China and Bangladesh to continue to be top draws because employers have become used to working with them. Singapore has 277,600 construction workers and the bulk of them come from India, China and Bangladesh. Beyond raising salaries, the construction sector should also take a longer-term view at raising productivity to wean itself off foreign labour, said Mr Neo Choon Keong, BCA's group director of manpower and strategic policy. He said: "We no longer expect to have such a large supply of workers in the future. "We're investing in technology to improve productivity so the number of workers will be contained even as development ramps up here."